Many service professionals rely on Ford Transit vans to get their work done each day. These service professionals include plumbers, electricians, HVAC contractors and more, and they often choose to upgrade their vehicles with a wide range of accessories — Ford Transit interior panels included. You’ll find all that and more when you choose Ford Transit ceiling liners and other accessories from Advantage Outfitters, LLC. We offer a vast selection of Ford Transit wall panels for sale, and you can always count on everyday low pricing, high-quality products and much more when you choose us. Our Ford Transit interior kits for sale offer several advantages for your van. You'll find many options to ensure you get a liner kit that fulfills your specific needs for your vehicle. Do you need something lightweight to get a liner with a reduced effect on gas mileage? Or, are you looking for insulated panels to keep your interior protected from the heat and cold? You'll find options to fit both situations and much more. Plastic liners are lightweight and easy to install. When you install a plastic liner kit, you won't add a lot of extra weight to your van. If you regularly haul cargo in your van close to carrying capacity, you don't want to weigh your vehicle down any further with a heavy liner. Plastic liners also give you the interior you want without causing a drop in your gas mileage from excess weight. Insulation is another quality benefit many people look for in their Transit interiors. Our insulated panels use R4 insulation. With proper insulation, you can keep the interior comfortable, which is essential if you want to reduce the use of your vehicle's heating or cooling system. Insulated wall panels for your Transit cargo van also cut down on road noise. If you drive your Transit as part of your job, reducing road noise will help cut down on headaches you may experience from the constant, low-level sound you encounter daily. The back of a Transit can have damage from heavy equipment and tools tossed into it. Liners on the walls, doors and floor can protect the interior of your van from damage work equipment causes. You'll help keep your Ford Transit on the road longer while improving its interior appearance. Our durable liners have a design that will last. You have many options for a custom fit. Our Ford Transit liner kits come in multiple sizes, and you don't need to memorize serial numbers when ordering. You only need to know the wheelbase, ceiling height and door design of your van to select the wall panels for your Transit cargo van that will fit perfectly. Value is an essential part of any upgrade you make, especially to company vehicles. That's why we offer options for all budgets. You can still get the interior protection your business demands, while spending less than you might expect for a new van interior. Opt for quality when you choose Advantage Outfitters for Ford Transit interior panels. Our selection consists of products from only the most trusted manufacturers, and each panel and ceiling liner is strong, durable, sturdy and designed for a custom fit with your service vehicle. We offer an exclusive line of wall, door and ceiling liners made of lightweight, durable plastic, which can give you better gas mileage while maintaining some of the most affordable prices on the market. Our comprehensive selection of Ford Transit interior panels includes the following. Wall liners: Our insulated and non-insulated Ford Transit wall panels are the ideal solutions for protecting your van from harsh everyday use. The manufacturers specifically designed these liners for use in vehicles with rear-hinged doors and single-side sliding or barn doors. Door panels: Choose from one of our insulated or non-insulated door panel options for superior protection. We offer kits for both hinged and sliding side doors to accommodate a variety of Transit models. Ceiling liners: Our half-inch, heavy-duty ceiling liners feature a layer of foil/foam insulation attached to the back of the panels. These liners are perfect for insulating your roof and protecting your vehicle from extreme temperatures. If you want protection for your van's roof, you'll want to buy ceiling panels for your Transit work van in addition to wall and door panels. To fully outfit your van for all of your job requirements, consider adding this equipment to your Transit van. Partitions: With our partitions, you can create a workspace behind the driver's seat. With our variety of options, you can choose from aluminum or steel, with or without a door. You can even select whether you have a sliding door or a swing door. The makers of our partitions use durable, yet lightweight, material for long wear without weighing down your van. Shelving: To make your van work for you, organize it with shelving. We have both kits and individual shelves to create the workstation you need in the back of your Ford Transit. Wait until after installing your wall panels before putting the shelving inside to save yourself time later. Floors: Protect the base of your van with our durable floor coverings. You can choose from aluminum, rubber and composite surfaces. With a protective floor covering, work boots and tools won't damage the floor of your Transit van. When you need wall protection for your van, you have many options, and it can be difficult to choose among them. That's why you need to know what to look for in your Ford Transit van interior wall panels. First, do you need insulation against heat, cold or noise? Check out our insulated wall liners. Insulation protects the interior of your vehicle from the outside. But if you want to cut down on cost or weight, consider non-insulated panels. The wall protection you choose will depend on whether your Transit model has rear doors or a side sliding door. We have wall protection styles to fit both designs. You won't have to give up your dream of wall panels in your van if you have side doors. We have options to suit your van's style. Van liners can help your Transit look better, resist damage and make your van more comfortable. Whether you drive a van for an HVAC company, shipping service or a plumbing business, you can customize it with our liners to make the interior tough enough for commercial use. Customized interior: Just because you drive a van for work does not mean the interior has to look industrial. Interior liners give your van the look you want. Additional features you can incorporate into your lined van include ladder racks and shelving systems for vans with high or low roofs. Protection: Liners inside your van protect it from damage from work boots, tools, equipment and more. Protecting the interior of your vehicle means you can make your van work as hard as you do without worrying about damaging company property. Reduced noise: Your work van is like a mobile office. As such, you may need to be on the phone in your van. Van liners with insulation reduce noise from the road. If you ride in a Transit for work and need to talk on your cell phone, excessive road noise can make it hard to hear. Cutting out the sound with insulated van liners makes it easier to hear your phone or others with you in the vehicle. Temperature comfort: You should make your vehicle as comfortable as possible, while simultaneously protecting the tools and gear you carry. Keep the temperature in your van steady with insulated liners. Better insulation will reduce the amount you need to keep your van's heater or AC running. Cutting down on air conditioner and heater use can save on gas mileage, which will save you money over time. The interior of the van will be even more comfortable. We carry both vanLiner and Legend Fleet brands of wall panels. Both brands are high-quality. Check out the features of each brand's offerings to see which is best for your Ford Transit. vanLiner: Panels by vanLiner come in 3/16-inch thicknesses. The company makes both plastic wall panels and door panels. Pre-drilled holes ease installation of this brand's panels. Legend Fleet: If you need a thicker panel with added insulation, consider the panels from Legend Fleet wall liners for Transit vans. We carry half-inch-thick panels made with Duratherm insulation from this brand. Choose this brand for sound deadening or for R4 insulation. To achieve the best insulation, also buy insulated door panels and a ceiling liner. Both brands offer multiple sizes for various van heights. Order based on whether your van has a low, medium or high ceiling. You will also need to know the wheelbase of your van. Standard sizes are 130 inches or 148 inches. If you have an extended van, that will also be a parameter when you order your wall panels. The brands we carry include wall panel kits for both 130-inch and 148-inch wheelbase vans. We also have wall panel sets for all roof heights and even for extended vehicles. You will need to determine the depth, 3/16-inch or half-inch, as well as the material used. If you need to buy door panels for your Transit van, you won't find those in a wall panel kit. But it is an advantage to you that the kits don't include door panels. You can choose whether you need sliding or swing door panels for your van. You should also choose door panels to match your wall panels. Selecting matching door and wall panels becomes important when you have insulated wall panels. Using uninsulated door panels with insulated wall panels will reduce the effectiveness of the insulation. The same is true when you choose ceiling panels. When ordering doors, you need to select from one of the brands we sell — vanLiner or Legend Fleet Solutions. Next, pick the ceiling height of your van — low, medium or high. Finally, choose your door style — either swing-open doors, also called barn doors, or sliding doors. Rest assured our door kits will fit. The manufacturers cut the panels precisely to fit onto your Transit's doors, whether you have barn or slide doors. Precision cutting of the doors makes installation even easier. Both barn and slide door kits come with four panels: two for the rear windows and two for the side. But don't forget to order your wall panels and ceiling liner, too, because we sell those separately from our door kits. We sell Transit van roof liners separately from our wall liner kits, but these are a critical part of your van's interior. If you want to install insulated wall panels and doors, you will also need to insulate the ceiling of your van. Heat rises, and if you want to keep the warmth inside your van during the winter, you need an insulated ceiling. The insulation enhances the existing thermal properties of the van, making it less likely to experience swings in temperatures due to the weather. Just think, your van's interior won't get as hot in the summer or as cold in the winter if you have the walls, doors and ceiling insulated. Maintaining a stable temperature inside your van starts with the interior design. Insulation on all sides will help keep the van more comfortable. You can install our Transit ceiling liner on vehicles with barn doors or sliding doors. Specify your door type and ceiling height when you buy Ford Transit ceiling panels to get the right size liner for your Ford. When you order the correct ceiling panels, you will get a liner cut to fit your van. Installation requires a few simple steps using the pre-drilled holes. Like the insulated wall panels we sell, our ceiling liners have insulation on the back of the panels for a one-step installation process. You will find installation instructions for your ceiling panels on our product page. When you install your Ford Transit side panels, you'll appreciate the ease of installation of both brands. Both manufacturers cut the panels to fit your van. If you choose the correct size when ordering, you will have no problems installing your Ford Transit side panels. For vanLiner, the holes you need in the panels are pre-drilled, making it easier to set them into place in your van. With Legend Fleet Solutions liners, you also install them with self-drilling screws and pre-drilled holes. You don't have to be an auto expert to install wall panels in your Ford Transit van. We make it easy by providing you with not only easy-to-install wall panels, but also the instructions you need. Find all installation instructions on our wall panel kit pages for the product you select. We offer a range of ways to customize your Ford Transit, from our Transit wall liners for sale to our door panels. You need your vehicle to withstand the rigors of your daily job while still allowing you to be comfortable inside and have your tools close at hand. Our products offer solutions to some of the most common problems business van drivers experience. Van is too hot or too cold: Insulated liners on the walls, doors and ceiling will prevent temperatures outside from making it uncomfortable inside the van. Interior needs protection: Liners covering your van's walls protect the interior from dents and scrapes. Lightweight, economical non-insulated liners supply protection for the sides. If you prefer temperature control, too, choose our insulated wall panels. Both models require simple tools for installation and have panels cut to fit your van. Floor gets scuffed: Our floor coverings add both protection and style to your Transit van's floor. Too noisy: The half-inch insulation in the Legend Fleet Solutions liners we sell blocks out road noise, keeping it quieter inside the van. High gas mileage: Don't think you need massive additions that weigh down your van. We offer lightweight plastic options that won't drive down your gas mileage. If you want the lightest choice, opt for our non-insulated liners, which also have an economical price. Need to separate cabin: Separate the back of your van entirely from the driver's cabin with a partition. We offer partitions with or without doors. Separating the cabin from the rear of the van gives the driver more focus on the road and increased safety. The partition is also a safety feature — if you must stop suddenly, the barrier will block tools in the back of the van from striking those in the cabin. You need your Ford Transit to work for you, and our accessories, panels and more can help your van become more practical for your job. When you rely on your Ford Transit daily, you can expect your vehicle to undergo significant wear and tear over time. Minimize the risk of scratches, dents and other damage while also protecting your equipment from the elements with interior panels precisely designed for your Transit. Your service vehicle is crucial to keeping your business running smoothly, so make sure you’re trusting it to a provider that delivers only the best products and customer service. You'll find everything you need in our vast selection of Transit interior kits for sale and other products. Check back regularly to find monthly specials and other deals on the products you need for your vehicle. When you choose Advantage Outfitters, you also get the customer support and technical assistance you need. If you have any questions or need expert guidance while navigating our selection, we’re always here to help. Our goal is — and has always been — to connect our customers with the perfect solutions for their service vehicle needs — including Ford Transit ceiling liners, wall liners and interior panels. 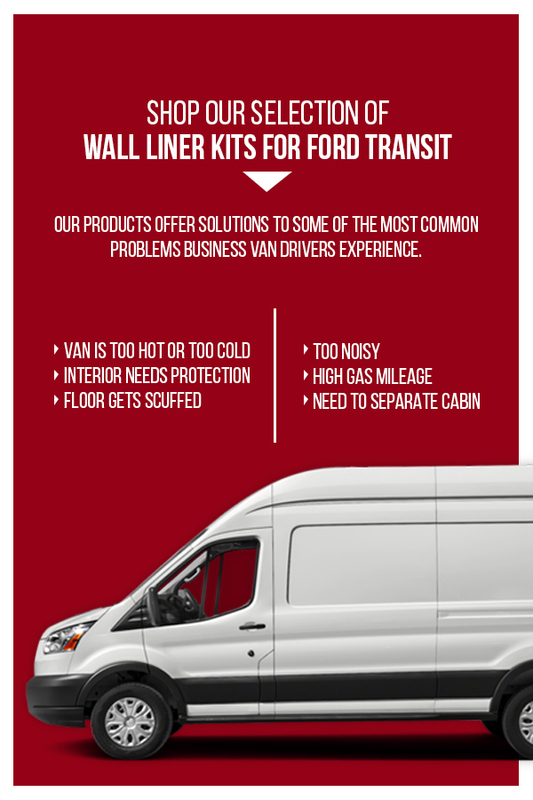 You'll benefit from industry-leading customer service when you choose Ford Transit van wall liners for sale from Advantage Outfitters. Browse our selection of Ford Transit wall panels for sale to find what you’re looking for today. Order online to take advantage of our discounted prices and fast shipping.